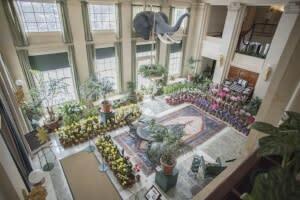 Rochester, N.Y., January 12, 2018—The George Eastman Museum brings springtime to Rochester a few months early, with the annual Dutch Connection floral show, on view Friday, February 9, through Sunday, February 25. This colorful two-week display features thousands of flowering bulbs in George Eastman’s historic mansion. Dutch Connection is a welcome treat in the midst of winter. The museum’s historic Colonnade, Palm House, and Conservatory will be filled with the sights and scents of spring—with thousands of tulips, hyacinths, daffodils, amaryllis, and freesias in the same various vibrant shades that Eastman featured 100 years ago. In addition, tropical orchids will be displayed, courtesy of the Genesee Region Orchid Society. Also on view on the second floor of the mansion are artifacts from George Eastman’s life in 1918. Eastman’s annual bulb orders were inspired by a trip he made to Holland in 1890. He was impressed by the tulip fields he saw while bicycling through the countryside. The present-day display is based on Eastman&apos;s original orders placed with Dutch bulb companies. The cultivation process began last July, with six thousand bulbs growing since October. Enhance your Dutch Connection experience by arranging a group tour, attending a talk and tour with the museum’s landscape manager, or attending any of the following public programs offered during the two-week event. New this year, the museum is offering an opportunity for kids to learn about bulbs and plant their own to take home. The children’s bulb potting activity will be offered from 10 a.m. to 2 p.m. February 18–24, in the museum’s Curtis Theatre, and it is included with museum admission. The Eastman Museum offers private group tours of Dutch Connection during regular museum hours. To set up a tour or for more information, please contact Stacey VanDenburgh, guest services manager, at (585) 327-4838 or tours@eastman.org. Saturdays, February 10 & 17, 10 a.m.
Sunday, February 18, 10 a.m.
A casual conversation with Landscape Manager Dan Bellavia. Free for museum members; included with museum admission. Reservations are required and can be made by calling (585) 327-4850. Take a holiday from the Rochester winter with one of Hollywood’s most sweetly romantic films. Brunch will be served in the Potter Peristyle, followed by a screening of Roman Holiday (William Wyler, 1953) in the Dryden Theatre. Reservations are required for brunch and can be made by calling (585) 327-4935. Tickets: $45 per person, includes brunch and film. Film-only tickets are available for regular admission rates at the Dryden box office. The event is organized by the Eastman Museum Council and proceeds benefit the George Eastman Museum. Tuesday, February 13, 7:30 p.m. In conjunction with the museum’s annual Dutch Connection floral display, this program presents short silent films from the collection with flowers as a main motif. These selected works—curated by Maddi Lopez de Arkaute, a recent graduate of the museum’s L. Jeffrey Selznick School of Film Preservation—range from 1902 to 1929 and present wide stylistic diversity, from hand- and stencil-applied techniques to additive color processes like Chronochrome and subtractive systems like Kodachrome. Live piano accompaniment by Philip C. Carli. Regular Dryden admission prices; $10 general, $7 members, $5 students. February 18-24, 10 a.m. - 2 p.m.
Take a piece of Dutch Connection home with you! Drop in to the Curtis Theatre between 10 a.m. and 2 p.m. to learn about bulbs and how to plant them. Plant a bulb of your own to take home and watch it bloom! For ages 12 & under (accompanied by an adult). Free to members; included with museum admission. For the last 24 years, Dutch Connection has been made possible by the generous support of Gerald P. and Karen S. Kral. Greenhouse services have been provided by Lucas Greenhouses. Attn. Media: High-res images for Dutch Connection are available for download here: https://eastmanmuseum.box.com/dutchconnection.